Given Taiwan’s precarious lack of strategic depth as an island, it is only fitting that its president, Ma Ying-jeou, should have written his doctoral dissertation on sovereignty disputes in the East China Sea. Last month, President Ma also put forth one of the best pieces of statecraft emanating from the region of late. His East China Sea Peace Initiative calls for restraint and cooperation. Unfortunately, as tensions have mounted in the East and South China Seas, Taiwan expressed its position in some unhelpful ways, including live-fire drills on the largest of the disputed Spratly Islands. More recently, Taiwan escalated its presence in the East China Sea this week by dispatching a small armada of some 40 fishing boats and a dozen patrol ships into the Senkaku/Diaoyu Islands, some of which were met with Japanese coast guard water cannons. Like every other actor, Taiwan seeks to mix persuasion and coercion to advance its interests. It’s bad enough when China stifles Taiwan’s contributions to international bodies such as the World Health Organization. But it’s even worse when Taiwan is not part of the conversation about territory and territorial waters that it claims. Taiwan has been turning up the heat over Japan’s move to nationalize the Senkaku/Diaoyu Islands, as well as Vietnam’s increasing intrusions into territorial waters around Taiping Island. Taiwan’s claims to the Senkaku/Diaoyu and Taiping Islands are as legitimate as the claims of most actors. Indeed, even when it comes to Taiping, which is about 1,000 miles away from Taiwan, possession is nine-tenths of the law, and Taiwan occupies the island, recently adding machine guns and mortars to the only Spratly Island with its own runway and fresh water. Unfortunately, Taiwan resorts to the same grandiose declarations as does China when it comes to the South China Sea. Both capitals use the same vague 9-dashed line map with little basis in international law. That claim, coupled with recent live-fire exercises in the South China Sea, is not encouraging members of the Association of Southeast Asian Nations (ASEAN) to argue for Taiwan’s participation in multilateral talks. As a big, small power with a tenuous political position because of China, Taiwan doesn’t advance its own interests by alienating ASEAN states. More to the point, Taiwan is at risk of missing an opportunity to be part of the regional security dialogue. Taiwan needs to keep its eye on the ball. Despite its Economic Cooperation Framework Agreement and improved cross-Strait relations, or maybe because of them, Taiwan finds benefit in carping about its neighbors, especially Japan and Vietnam. Some in Taiwan also misconstrue America’s treaty commitment to Japan (which includes both the defense of Japan and territories administered by Japan) with its neutral policy stance when it comes to disputed sovereignty. Taipei is also critical of the United States for reneging on a promise to help Taiwan buy submarines and advanced F-16 C/D fighters. But Taiwan needs to focus on vital strategic goals, a major one of which is a better way to live freely beside a rising China. The Philippines’s recent experience over disputed Scarborough Shoal suggests that compromising with China can be costly. When China pockets a concession and then moves assertively forward, the conciliatory party looks like an appeaser. When a dispute with China re-emerged in April, Washington counseled its ally in Manila to de-escalate tensions over the Liancourt Rocks, which are clearly within the 200 nautical mile Exclusive Economic Zone of the Philippines. But China, with its debated historical claim to the distant rocks remains in place with its civilian law-enforcement vessels and fishing fleet, and, just over the horizon, its navy. As with the Philippines, the major potential threat to Taiwan’s sovereignty emanates from a rising China. Taiwan needs an effective strategy for countering Chinese pressure. Clearly Taiwan needs stealthy, capable platforms and a better anti-access strategy. But advanced weapons systems alone cannot provide greater security, and what Taiwan most needs is greater economic and political support. Trade agreements that prevent Taiwan from excessive dependence on the Mainland and express its trans-Pacific interests, and political integration are areas that need as much attention as military affairs. Vladivostok seems an unlikely venue for Asian peacemaking. But at the recent meeting of Asia-Pacific Economic Cooperation forum, many leaders reportedly endorsed including Taiwan in future Code of Conduct discussions. While such talks are long underway between ASEAN and China, they are apt to expand to include others. ASEAN is at the center of other institutions that are more inclusive—from the East Asia Summit to the ASEAN Defense Ministers’ Meeting-Plus. Taiwan could be brought into some of the discussions of these inclusive conclaves. While China will resist Taiwan’s participation, the region could be mobilized by innovative proposals that Taiwan might make for the good of the whole region (and for the good of Taiwan’s security). For instance, some Asian specialists have suggested that Taiwan would look brilliant if it would drop the cow’s-tongue-like claim to most of the South China Sea and instead base its boundaries on specific land features that correspond with prevailing international law. Moreover, Taiwan can take the lead in establishing some badly needed constructive dialogue and confidence-building measures. For instance, some experts have suggested, rather than flying legislators to Taiping Island to stir up nationalist sentiment, what might be the effect of Taiwan flying an international group of experts to the island to jaw over constructive ideas for cooperation over fishing, maritime safety, and other building blocks of peacemaking? 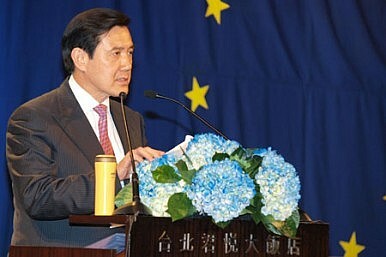 When Ma Ying-jeou wrote his dissertation in the early 1980s, he looked at legal disputes in the context of a zero-sum Peking-Taipei rivalry. His proposal last month for a new peace initiative can thus be seen as having been in the works for some three decades. Regardless of the wait, his call for restraint is a healthy antidote to the hyper nationalism presently so in vogue. And with the support of the United States, ASEAN members, and Japan, Taiwan can better secure its strategic interests, while contributing to a tamping down of tensions in the South and East China Seas. Dr. Patrick M. Cronin is Senior Advisor and Senior Director of the Asia-Pacific Security Program at the Center for a New American Security, and the editor and co-author of Cooperation from Strength: The United States, China, and the South China Sea.